After the 2012 election, I had one wish: that the back of the Republican establishment would be broken. Not because they were bad people, or had ill will, but because the Republican Party needed to be shaken up. After two Bush presidencies and two losses in the presidential elections of 2008 and 2012 by Sen. John McCain of Arizona and Massachusetts Gov. Mitt Romney, something needed to shake up the party. We needed more women, more minorities and more focus on building opportunity for all Americans. Little did I know that just four years later, my wish was going to be granted -- and oh so much more. 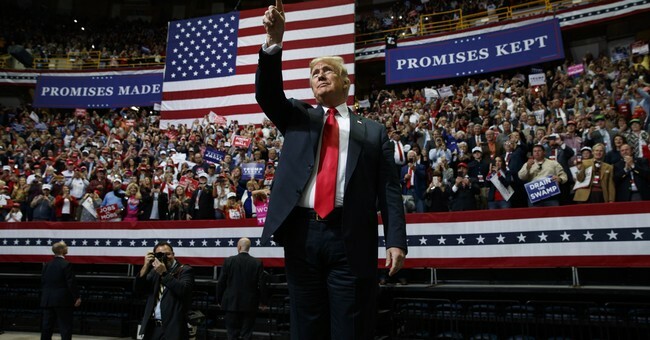 Since his election, Trump has broken the presidential mold by holding almost nonstop rallies; changing trade agreements; signing tax reform; reducing regulation; negotiating with North Korea; signing opioid legislation; appointing conservative judges; and working to secure our southern border. I could go on and on with his accomplishments -- but I only have so much space. Let's just say Trump has accomplished an enormous amount. Yet many people still dislike him. Some of that is the result of continually negative press coverage. Some comes with the job, but some of that is due to his style -- direct and occasionally graceless -- traceable to his background as a New York developer and reality television star. As we now know, the Republicans lost the House but strengthened their hold on the Senate. From a political perspective, that may have been the best outcome for Trump, since he now has a natural foil: presumed House Speaker Nancy Pelosi, D-Calif. Despite all that, he is not assured a victory in 2020. That's because the news media will continue to cover him unfairly. He can continue to call their stories fake news and describe them as unfair, but he will not be able to change their thrust and tenor. Trump can't control this. If he tries to, by creating a national network (which he mentioned recently), the blowback would be disastrous. So where is the opportunity and potential shake-up for the party? Look at the midterm results. Nate Silver, writing last week for his 538 website, noted the "exceptionally high turnout. Turnout is currently estimated at 116 million voters, or 49.4 percent of the voting-eligible population ... 83 million people voted in 2014, by contrast." What's more, the "Democratic candidates for the House will receive almost as many votes this year as the 63 million that President Trump received in 2016." Additionally, young voters favored the House Democrats by 35 points, and "the Hispanic share of the electorate increased to 11 percent from 8 percent in the previous midterm." The net result, per Silver: "Republicans can't win the presidency by turning out their base alone." In addition, the suburbs went primarily to the Democrats, according to a New York Times article written by Emily Badger, Quoctrung Bui and Josh Katz, "The Suburbs Are Changing. But Not in All the Ways Liberals Hope." They wrote, "rural areas are now reliably Republican, urban areas overwhelmingly Democratic. The suburbs are lodged in between, with many economically conservative but socially liberal voters who have a foot in each party -- or for whom neither party is a perfect fit." According to the article, these suburban voters' priorities "are homeowner, taxpayer and school parent." The writers note that "President Trump has done much more to stress the cultural issues on which many highly educated, white suburban voters disagree with the Republican Party than the economic issues on which they're better aligned." I would argue the press has focused on the cultural issues rather then Trump -- but the end result is the same. The opportunities for Trump and the Republican Party? Continue to focus on economic issues and to reach out and engage with minority, women and young voters by listening to them and including them. We still need more women, more minorities and more focus on building opportunity for all Americans. This needs to be done not only at the national level -- but also at the state and local levels. This month's push by Trump for the First Step Act, a criminal justice reform bill, is a perfect example of an issue that can create opportunity and attract more voters. I absolutely believe that Trump wants the best for all Americans -- but I am not the one who needs convincing.